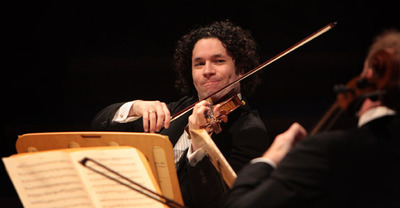 Gustavo Dudamel picked up his violin Tuesday for a chamber-music concert with members of the Los Angeles Philharmonic, and Mark Swed's LA Times review is here, with blogosphere commentary from Roger Bourland helping to fill out the picture. Among the titan conductors who also perform on an instrument these days, the names I can think of are Daniel Barenboim (piano), James Levine (piano), Lorin Maazel (violin), and now Dudamel. I must be missing someone, though I can't think of whom. Myung-Whun Chung doesn't play piano anymore, I'm pretty certain, and Gerard Schwarz doesn't even list his career as co-principal trumpet in the New York Philharmonic trumpeter in his official bio. Others? Update: Readers have written in to say that Antonio Pappano performs on piano (love alliteration), that Alan Gilbert also plays violin (must be an under-45 thing), and that Osmo Vänskä occasionally pulls out the clarinet. I mean to open the comments earlier, and they're open now. Vladimir Ashkenazy, like Barenboim, mainly conducts nowadays, and has been music director of many orchestras, but he too remains a formidable pianist, working mainly in the recording studio. Christoph Eschenbach still plays piano in song recitals, I believe, though I haven't heard him do it for some years now. A number of famous instrumentalists have committed to conducting enough to have been music directors of more than one orchestra each, while still playing solo. Pinchas Zukerman and Jeffrey Kahane, for starters. MG: I left out folks like Zukerman and Kahane who do more playing than conducting, and can't believe I forgot Eschenbach. Previn's website doesn't list any performances after 2006, but yes, he would have qualified. Two further nominations from north of the 49th: Toronto Symphony's Peter Oundjian was in the Tokyo String Quartet for years before focal dystonia cut that short. He still plays on occasion for fundraising events. Alain Trudel, director of the soon-to-be-defunct CBC Radio Orchestra still plays and teaches trombone. In England, there is oboist Douglas Boyd in charge of the Manchester Camerata as well as being connected with the Colorado Symphony ant St Paul CO.
Stephen Kovacevich would be a pianist who sometimes conducts. Michael Tilson Thomas occasionally plays piano in public and is a superb pianist. He and Alexander Barantschik (I am probably misspelling that...), the concertmaster of the SFS, played a Mozart violin sonata last year before the symphony played Mahler's 7th. If we get into early music, this could go on for a while longer. Many of those "conductors" (a relatively recent concept) are continuo players (Christophe Rousset, Bill Christie, Robert King, Christopher Hogwood, Emmanuelle Haïm, Richard Egarr, Trevor Pinnock, Céline Frisch, Gustav Leonhardt), but just as many are violinists (Rinaldo Alessandrini, Jean-Christophe Spinosi, Jeanne Lamon, Pablo Valetti, Richard Tognetti). Another violinist, Andrew Manze, has just gone from early music to being the music director of the Helsingborg Symphony. Federico Maria Sardelli is a recorder player. René Jacobs was a countertenor. Nikolaus Harnoncourt was a cellist. Philippe Herreweghe was a pianist. I think I should stop now. MG: Good points! We could include Ton Koopman and Nicholas McGegan in that list. When thinking of early-music conductors, it's interesting that John Eliot Gardiner isn't known for any particular instrumental prowress, right? Yakov Kreizberg is playing a one-hour recital of Grieg and Tchaikovsky with Julia Fischer at the Prom Concerts this summer, then conducting the Netherlands Philharmonic there the next day.